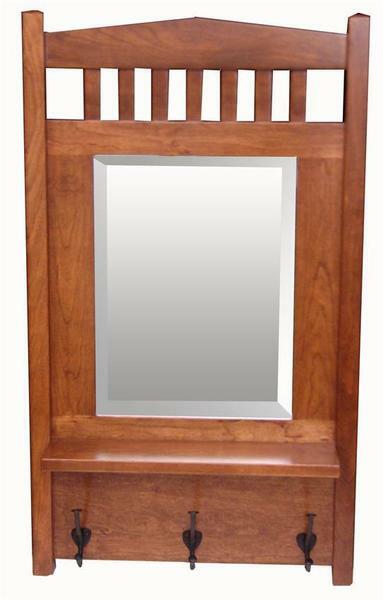 The Amish Hardwood Mission Mirror with Shelf is beautiful, Amish made and full of function. This lovely mission style mirror provides a mirror just where you need it. Great for use in a bedroom, walk-in closet, hallway or foyer, your solid wood mirror will stand out. This mission mirror provides a solid wood shelf for storage and display. Keep your keys, comb and phone near the door or line the shelf with your elegant perfume bottles. In addition to graceful woodworking and shelf space, this Amish mirror offers three hooks to hang purses, jackets, and sweaters. Enjoy the quality of your Amish made mirror that is built to last. Take a look at our entire collection of Amish Mirrors to select the one that will serve you best. Call one of our Amish Furniture Specialists today at 866-272-6773 with any questions. 20" x 5" x 35"